As the wave of new Polish stadiums reaches lower leagues and smaller cities, another one is nearing delivery in the Silesian city of Tychy. It’s over 2 years into the construction process, which started with official groundbreaking in October 2012. 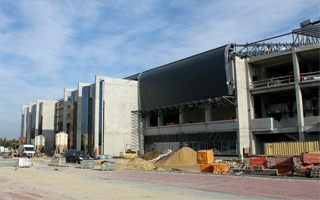 The outcome so far: all of the seating bowl is in place, while last works on external concrete structures are ongoing. Also, all 92 primary beams supporting the roof are in place, while roughly 75% of the structure is also covered. The cover – a dark grey trapezoidal sheets – will become the stadium’s key aesthetic feature, enclosing both the roof and facades. Current works also include installation of the floodlights, which will be fitted around the edge of the roof. In total 208 lamps will provide matchday lighting, of which 40 are already in place in the western and northern stands. With capacity set at over 15,000 seats, the stadium is priced at PLN 129 million (€30m / $38m). On the one hand it’s expected to be one of the best throughout Silesia, Poland’s most football-rich region. But on the other, it’s also at risk of being underused in football terms as GKS Tychy are currently almost at the bottom of Polish second league (1. Liga). Construction will go on until the first half of 2015. So far there are no official plans concerning other events, but the stadium is certain to host games of Euro 2017 (U21) if Poland are selected as hosts by UEFA.